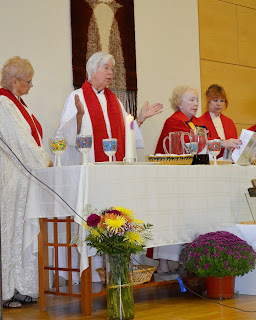 On Oct. 19th, 2013 at our Saturday evening liturgy, Maureen McGill, a deacon with the Association of Roman Catholic Women Priests, and Katy Zatsick, ARCWP, co-presided at a liturgy with Mary Mother of Jesus Inclusive Catholic Community in Sarasota, Florida. Deacon Maureen shared her thoughts and experiences on the theme of prayer. She presented the various types of prayers in the Psalms and focused on the prayer for help in crisis situations. Maureen, who is a lawyer, served as a Magistrate in her practice, provided an insightful, funny uptake on the persistent widow and unjust judge in the Gospel. The summation was that we respond to people's cry for help as the hands and feet, eyes and ears, and heart of God. MMOJ community extended a warm welcome back to Florida to Bridget Mary. 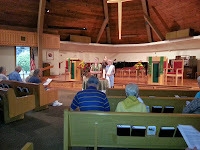 Nancy Fusillo, from St. Petersburgh attended this joyous liturgy. I first met Randy at our Wednesday night meal for the homeless before I was ordained. He couldn’t get up because he hurt his knees so I got his second plate of food. A long time passed before I heard “Hey, remember me? I’m Randy”. He told me that if he could just get his birth certificate, he could get on Disability and get food stamps. He asked me to help him so I whipped out my I pad and began what was to be a long process. Because he didn’t come every week and I needed additional information, we played the waiting game and what should have taken a few weeks ended up months because he was taken off to jail. When I finally saw him again, he said he got the certificate, but he hit a policeman and ended up in jail again. They didn’t give it back-could I please get him another one….so we began that process again getting some of the information, waiting for him to come to the Wednesday night meal to get the last few details. One of his friends finally took me to his place under the bridge. We got the process started. I went to visit him to find out he had an inoperable liver tumor. He said, “I am going to die but I am not afraid. “ We sang and prayed and I listened to his stories of family…. During the time I had the overwhelming feeling of the feminine power of the loving God wrapping her arms around Randy and making a way of comfort and peace as he lived these last days. Perhaps the greatest of all signs of God’s love was that for the first time in 7 years, he called his sister who had prayed for him always wondering what happened to her brother… within a few short days there was a peaceful reconciliation and a binding of souls in love once more. Facing death, Randy wanted to have all his papers in order. As we walked slowly up the hallway to his room to complete the last set, I sensed he was weaker. He used my shoulder as his leaning post. After he signed the last piece of paper, he relaxed. As a matter of fact, he joked with me. He got in bed and began to doze off so I thought I would leave quietly. But before I got to the door I heard this “Hey!” When I returned he had his big arms open for a hug and said “I am so grateful for all you did for me and for being my friend. And tell the people at that church thanks.” I told him it was my privilege and his mother sent a lot of us as angels to be with him to let him know everything is OK. And as I walked away he reminded me to bring that beef stew from the church and a can opener….We left laughing. 24 hours later he moved onto the next stage of his life. Reflecting on his peaceful death, I gave honor to all that ministered to Randy, the people and institutions that received him. I sense we are each like a part of an unheard symphony of goodness and kindness. From the people at First Metropolitan Community Church, to Grady and their nurses, the social workers, his friend Billy, St. Joe’s and the Sisters at Our Lady of Perpetual Help, I hear each person’s goodness as a holy note woven into the broad reaches of society confirming a melodious sound that raises up the dignity of each human being. We men and women are the people of “Good News” bringing a song of hope to our earth…“when you did this to the least of my brothers and sisters, you did this for me”. Rev. Diane Dougherty, ARCWP Rev. Diane works at First Metropolitan Community Church in Atlanta an Inclusive, compassionate and empowering community. She ministers to LGBTQ Families through their education department, supports their transgender ministries, and cares for the needs of the homeless. 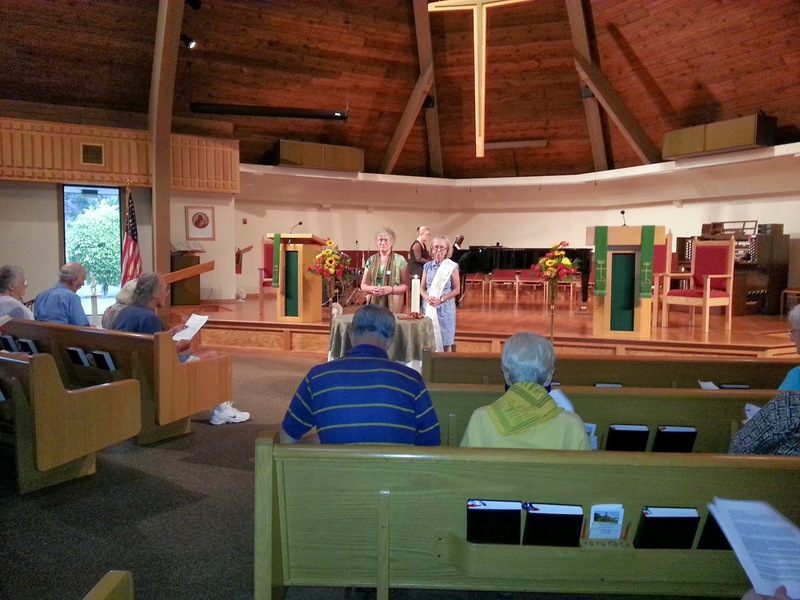 Homily for 29th Sunday in Ordinary Time by Judy Lee, ARCWP, Good Shepherd Inclusive Catholic Community, Ft. Myers, Fl. Today we consider the true power of prayer. To do that we must consider what it means to pray. I am not always sure that I know. When my heart is moved by nature, a person, an animal, a movie or a book, a sunset or a call from someone, and I say “Thank you God!” I know I am praying. When I join our congregation in the prayers of the liturgy on Sundays, or at a Prayer Service, or at a hospital bed side, I am praying. When I call out in desperation, “Help!” I am praying. When I take my morning walk and chant names and faces to God, I am praying. When I sit quietly and look at my lake, I am praying. When I see pain in people and places, I am praying. When I read the Scriptures, I am praying. I am not always praying in words. I am not always praying as Jesus suggests, but I do pray when I am not even conscious of praying. How about you? What is prayer to you? In Luke 18:1 Jesus tells us to pray always and not lose heart. Jesus is headed toward Jerusalem. He full well knows the path he is on and where it will lead for one who has the courage to confront the powers that be in “church and state”. He also knows the plight of those who accompany him and whom he accompanies- the poor, the dispossessed, the sick and outcast, the stranger and all those without power, including widows. He tells the story of the persistent widow to encourage those who have no power to keep on speaking up, if no one else will hear them, God will and God will deliver justice speedily to those that call upon God (verses 7-8a). Jesus does not want those who nobody hears to lose heart. God is with them. God hears and will act. In choosing the persistent widow as the unlikely heroine of this parable, Jesus once again empowers women. While some, including the corrupt judge, may see her as a pest and a whiner Jesus sees her as a winner. He is teaching here about the relationship of our loving and just God to the “weakest” among us. He is not comparing his loving Parent to a bad judge who needs to be pestered into doing right. Jesus is saying God is listening to the pain and need expressed to God. In Jesus’ time, widows, left without a wage earner and the one from whom they derived status, had no power. The word for ‘widow’ in Hebrew means ‘silent one’. Yet this widow needed justice enacted and she spoke up-she wanted “legal protection from an opponent” (verse 3, TIB translation). I think of the many women who seek orders of protection against abusive men in their lives. I think of women who live in places where the law of the land clearly does not protect them. I think of women here who are still too frightened to get orders of protection and the violence and death that ensues. I think of women who are locked into abusive relationships dependent on a man’s income. I am thankful for the few housing opportunities we have for women with low or no incomes, especially for those with disabilities. Below is Karen who, at almost fifty years of age, now has her very first independent home through counseling, support, and Goodwill Housing. Karen prayed for her own home. Happy new home. Hooray for you, Karen! I think of the young girls who were shot for speaking out for the education of girls in Pakistan and elsewhere. To Malala Yousafzai,16, who survived being shot in the head and neck by the member of the Taliban for her views, and to her friends and classmates, I say, don’t give up, don’t lose heart, God is with you, and so are we. In the reading from Exodus Moses represents God’s power even in armed battle by holding his arms up. I think of how tired his arms were. And I am so thankful for Aaron and Hur who gave him a seat and stood on each side holding up his arms. I pray that we can find ways of holding up the arms of our sisters in lands where women are shot for wanting education. Perhaps we do it through public outcry and education, perhaps we do it through donations or diplomacy, but do it we must. A few years back, in Pakistan, some businessmen (Mr. Chapbra and Mr. Ahmad among the leaders) got together and developed TCF, schools for the poorest children in the land. They are trying to get 50% enrollment of girls and are near that goal. They are funded by individual and corporate donations and are making a big difference. (PBS and Undertold Stories, University of St.Mary’s, Minnesota). I think that addressing the issues of abuse in relationships is one of the hardest things we do pastorally, especially when economic issues reinforce the problems. I think of how tired we in the Good Shepherd Inclusive Catholic Community get in trying to hold up the arms of women and men who face despair, both economic and personal. I am so thankful for our Aarons and “Hers” who stand side by side with us to help our poorest sisters and brothers. When we act in community we can do anything. When we unite ourselves through prayer with the Birther/Father/Mother of the Cosmos we are truly empowered. When we pray, make time for communication with God, we tap into God’s power and God’s dream for the world and for us, and we awake. Then we bring God’s kin-dom to this world. Another Aramaic scholar, Rocco Errico, says “that the word for prayer in Aramaic is slotha. It comes from the root word sla, which literally means ‘to trap’ or ‘to set a trap’. Thus, prayer in its initial sense implies ‘setting your mind like a trap so that you may catch the thoughts of God’-in other words, ‘to trap the inner guidance and impulses that come from your inner spiritual source’…It is an ‘alert sense of total sensitivity and attentiveness’.” (Setting a Trap For God, pp.6-7). These definitions that come from the language Jesus actually spoke help us to understand how Jesus prayed and how we too can set the stage for being open to God in our praying. I think of the old hymn “In the Garden”-”I come to the garden alone when the dew is still on the roses…and the joys we share as we tarry there none other has ever known”. Prayer is a time of conversing and communicating with God who is communicating with us and loving us. Errico suggests that rather than play a recorded tape to God in prayer, that we come to God with a blank tape/DVR and receive the message that God has for us, and the power, love and joy that comes with our prayer relationship with God. Prayer is attunement. When we are open to all God has for us and gives us, our response is thankfulness. And we are inevitably guided into action. The story of the persistent widow assures us that God is attentive to us and in turn prayer is us being attentive to God as well. God will deliver justice and enable us to deliver it as well. In a sense the brave widow “hammered” on the bad judge’s door until he opened up and delivered justice. Our hammering is our speaking up for justice and enacting it with God’s help. 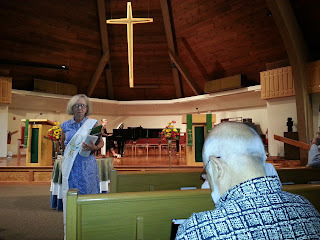 The old folk song by Peter, Paul and Mary runs through my mind-“If I Had a Hammer.” The song is prophetic- we sing out “warning and danger and the love of our brothers and sisters all over this land.” Here is the last verse-through prayer we do have what we need to make noise and act for justice. We will sing this in church on Sunday. “teytey malkuthakh”- “thy kin(g)dom come”. Through our fiery hearts and willing hands”. (Douglas-Klotz, Prayers of the Cosmos, p.19). 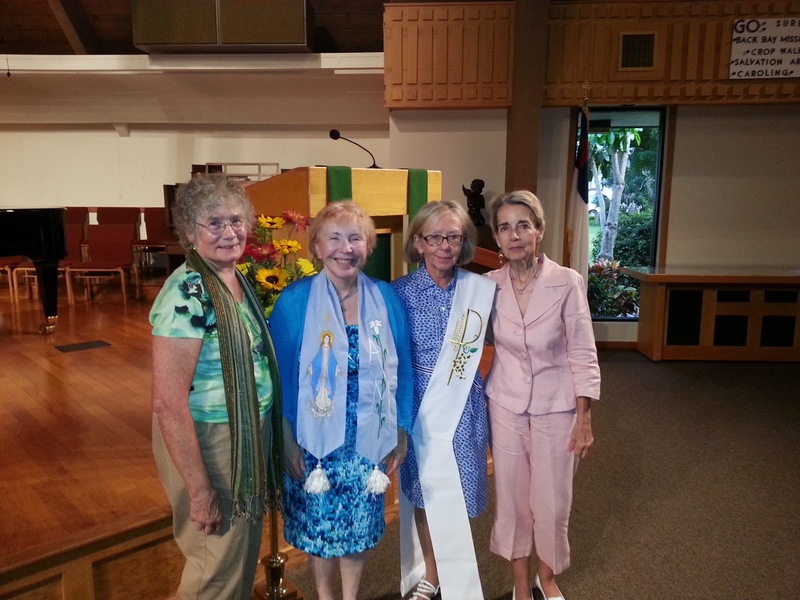 On Wednesday October 16th Deacon Maureen McGill accompanied women priests Judy Lee and Judy Beaumont in visiting a family in Tampa,Florida. This is a family that the Good Shepherd Co-Pastors have ministered with for many years. Originally from Puerto Rico, with later residence in Florida, the daughter, Nancy, was a MSW student of Dr. Lee’s in the University of Connecticut in the mid 1980′s. She became a wonderful social worker and was also a teacher,a poet and an Evangelical Pastoral Associate. She was the mother of twin girls, Shayra and Mia,now 23. 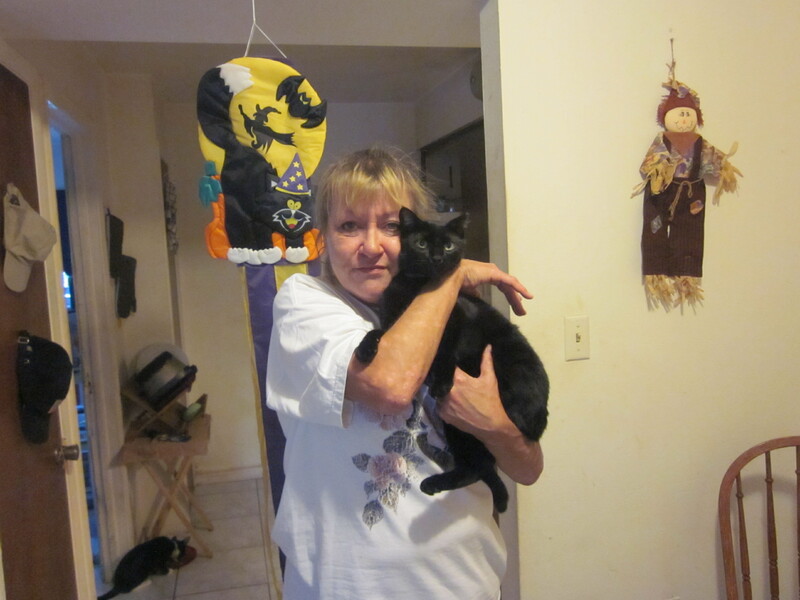 Because of serious Diabetes there were periods of time in which Nancy could not work and she struggled very hard to survive economically and as a single parent . At times she lived with her mother Miriam and she was Miriam’s only child. The family was very close and included an Aunt, Titi Gloria and a niece “Tata” who was raised by Gloria and lived with her in Gloria’s Senior Housing.. This is a family of faith and Nancy was its spiritual leader. She was an inspiration to all who knew her including us. At various times she asked us to pray with her and the family. When Tata was diagnosed with an advanced cancer in 2008 her time was short. The family was in crisis and we all faced this together. I gave dear Tata Holy Anointing and the family prayed with us.When she went home to God, we mourned with the family and helped Nancy to write the funeral liturgy. This loss was especially hard on Titi Gloria. She became especially close to us during this time. On special holidays like Noche Buena, the Christmas celebration, we would join Nancy and her family for a special meal prepared by Nancy and Miriam and for joyful customary singing with friends. When the girls were 11-12, Nancy was hospitalized for her brittle diabetes and was in a coma for five months. During this time Pastor Judy Beaumont and I would go regularly to Tampa and join Miriam in her bedside vigil,anointing Nancy and praying. MIraculously, Nancy emerged from the coma and began her life again. She was able to make a very special and wonderful Quincenera for her daughters and she was joyful at their High School graduation. She was delighted at knowing her grandaughter Sadie Belle Marisol for seven months. Yet her lot would be to go in and out of the hospital. In April of 2012 she suddenly fell into a coma and was rushed to the hospital where she lasted only a day. The family was in shock and we went immediately to them. Miriam’s grief was profound and she remained in this state for over a year. It was very hard for the whole family to regroup after this profound loss. My own heart is sad as we all face the world without Nancy in it. Yet we recall her with gladness because of who she was and the gifts of herself that she freely gave. With strong faith the family is sure that they will see her again with the Risen Christ. 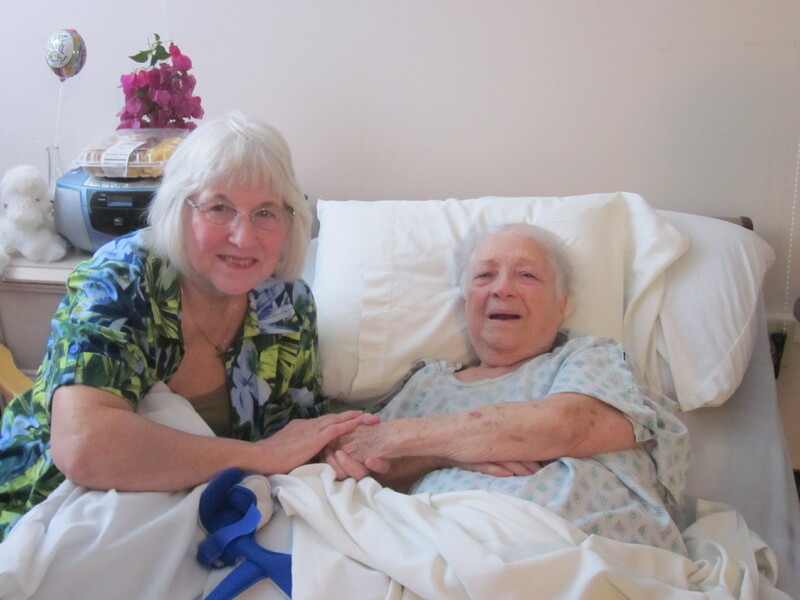 Miriam moved back into Senior Housing and eventually Shayra was able to move in as her caretaker. They are finally picking up the pieces of their lives and are beginning to have the joy in their lives that Nancy wanted for each of them. Yet, a few months ago Titi Gloria had a stroke. She is now in a Nursing Home and regaining some of her abilities. There is still paralysis on one side but speech and some movement is returning. Deacon Maureen joined us as she lives about a half our outside of Tampa and she is going to follow up in visiting Miriam and Shayra and Titi Gloria. This was a joyful visit as Deacon Maureen was welcomed into their lives. This is Deacon Maureen encouraging Shayra who designs costumes. 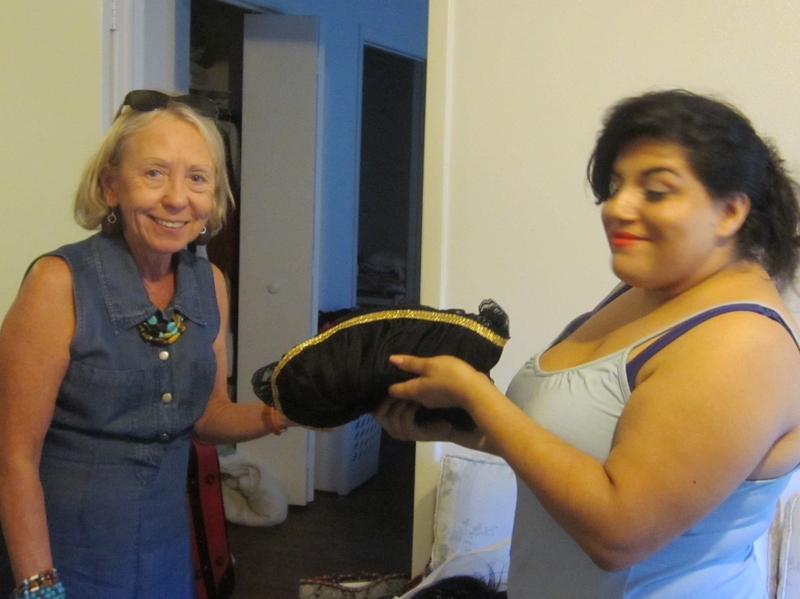 Shayra was delighted that Maureen understood the kind of designs and costumes she loves to work on. 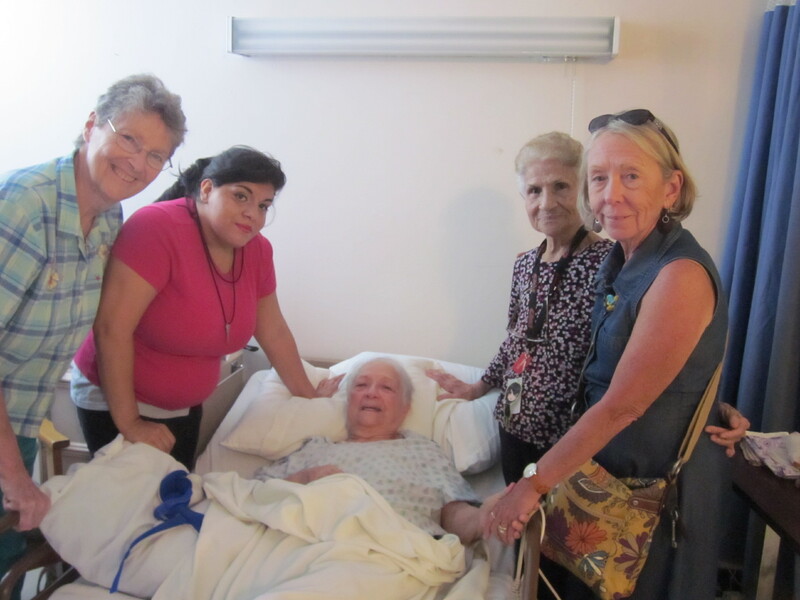 When we went together to the Nursing Home Miriam was so happy to bring the surprise visitors to her sister Gloria. Gloria responded first with tears then with great joy. I read some of Titi Gloria’s favorite Bible passages to her in Spanish and she was able to finish many of the verses. Then we looked at the family history that she kept in her Bible. We learned that this was the same day as her mother’s birthday! Miriam was happy to see the history so well recorded. Miriam will be ninety in December and Gloria will be 88. Gloria was happy to know that Deacon Maureen would be visiting her and she asked her to call her Titi too-”Aunty”. Maureen said she would be happy to do this.We prayed with Titi and also her roommate. Titi said a loud Amen! We will be back but we know this wonderful family is in good hands with Deacon Maureen. accurately reflects the message of Jesus. The parable has two characters—the woman and the judge. he is not in right relationship with others. he is not in right relationship with God. In short, the judge is not just. and women as men’s property. to order the protection required by the law. So she keeps on asking. he does it so he won’t be bothered by her any more. reflects the application made by the early Christian community. 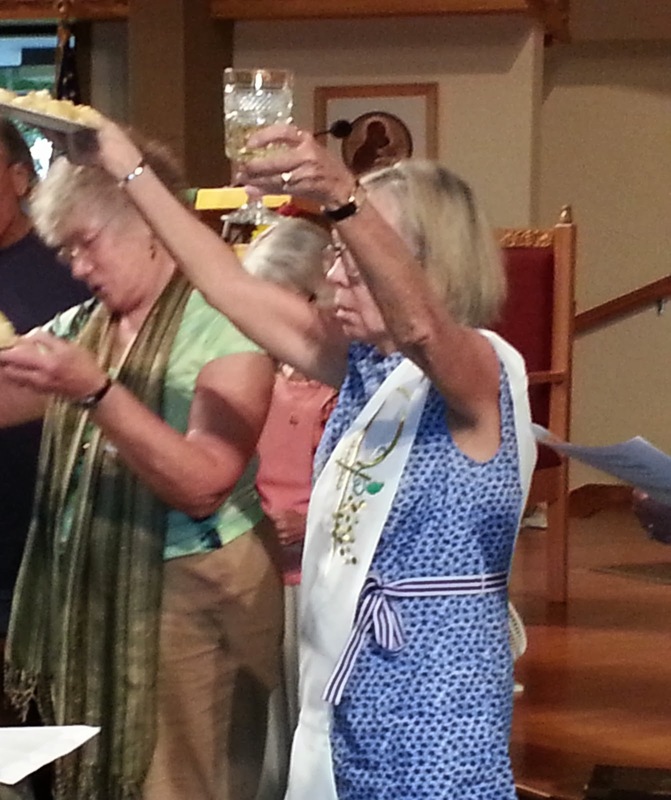 As time went on, some of the community had wavered in their faith. The first disciples were dying, and Jesus had not returned. They wondered if God had abandoned them. as an encouragement to continue to follow the Way of Jesus. to learn the lesson that it holds for us. and discern what these words of Jesus call us to. So, what do we see going on in our world these days? and the debt ceiling debacles. but they will return to the same issues again early next year. working on methods to prevent future atrocities. rather than attacking each other. just as Congress has failed to do its job. to call politicians to task about civility in campaigns. . They learned the need to keep the faith. They learned that, in the end, perseverance leads to justice. that we can learn from the judge and the widow? to all of earth’s living things, including us. It’s overwhelming. We feel powerless. that one in four Toledoans lives in poverty. much worse in other countries than here. to work on the systems and powers that cause injustice. is involved in some active work of social justice. some give advice and counsel. that goes way beyond your paycheck. that goes way beyond the task at hand. with a spirit of joy and love. At times we all feel powerless in the face of such great need. The lesson for today is that justice will win. Jesus is telling us to keep at it. "Roy Bourgeois, a former Maryknoll priest, has been disinvited from a Philadelphia-area fundraising event for the Survivors Network of those Abused by Priests (SNAP) because some members of the organization feared he would use the event to advance the cause of women's ordination...Bourgeois told NCR in a phone interview he was "disappointed and baffled" by his dis-invitation. He said he "rearranged my plans to attend a fundraising event for an organization which I hold in high regard. Then came the disinviting." "I was going there to support that organization and their cause," he said, "not to talk about women's ordination. "At the same time, he said, "I really believe that if we had had women in the clergy all along, we wouldn't have a need for this fundraiser because they never would have covered up for the old boys' club..."
"I always say, 'Over 5,000 priests in the United States have sexually abused or raped more than 12,000 children. 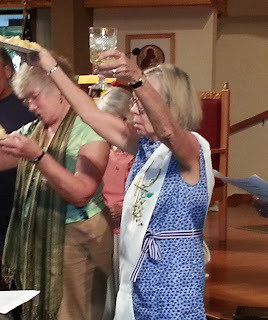 When Catholics hear the word "scandal," they don't think about women's ordination. They think of priests who abused children and bishops who covered it up.' "
When I first looked at today’s gospel, there did not seem to be much to it. research to see if I could get a perspective of a first century audience. Leviticus was written ca 1440 BCE and is thought to be written by Moses. God as a consequence of sin. It was viewed as an inexplicable act of God. keeping every letter of every law, no one was safe. Lepers were totally shunned and had to live outside the city or town. saw Jesus and knew of his healing power, they kept a respectful distance. according to the law, “Go show yourselves to the priests”. The lepers knew there was only one reason to seeking out the priests. scabs fell off, feeling returned and normal skin color was restored. One man chose to be disobedient and sought out not a priest but Jesus. a Samaritan, a foreigner as far as the Jews were concerned. and who refused to be separated from who gave him life”. He then tells him to “rise and go on you way”. a foreigner, I guarantee you that I would have been one of the nine. what I was told to do.” I may have said “no” to my mother once or twice. in obedience, but am I good in love? frees the mind from independent thinking. Mary Theresa Streck was ordained a Roman Catholic Woman Priest on Sept. 15, 2013 in Albany, left is Elly Marinaro, right of MT is Bridget Mary Meehan and Janice Sevre-Duszynska. This site is new and still under construction. Vision and mission statement coming soon!